Today, growers recognize the critical importance of root health and all of the factors that can influence it. If you were to ask 10 citrus growers what their nutrition program consists of, you probably would get 10 different answers. The microscope has been trained on citrus nutrition with increasing intensity as HLB spread across the state. Every season, growers and researchers continue to fine-tune their programs to enhance the productivity of trees afflicted with the disease. And these efforts appear to be paying off in some groves. Early estimates put the coming season’s crop at 70 to 77 million boxes, which would mark a significant bounce back after Hurricane Irma ravaged groves last season. Many attribute the general recovery of the trees to the strong nutrition program growers have developed over the years. Morgan has been on the front lines of citrus nutrition research for years, but that work took on enhanced importance when HLB entered the scene. 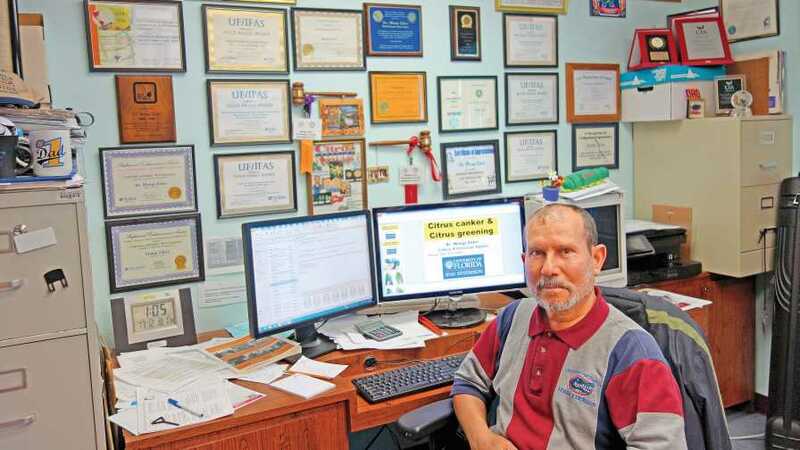 He partnered with Bob Rouse, a UF/IFAS Associate Professor (retired) of Horticultural Sciences, in an HLB-related research project to determine proper application of foliar nutrition. The five-year study began in 2010 in response to the strong uptick in foliar nutrition products being applied to HLB-infected groves. In the study, Morgan and Rouse observed that the UF/IFAS recommended rate of nutrients like magnesium, zinc, boron, and iron applied three times per year, rather than one time, performed best of the various rates trialed. In subsequent surveys with growers, they confirmed groves were doing the best where growers kept minor nutrients in this near or slightly above optimum range. Because of what they have learned through the research project and other studies, Morgan says UF/IFAS currently is revising its “Nutrition of Florida Citrus Trees” document to focus more on the concentration of nutrients and micronutrients based on sampling. They hope to publish it in early 2019. 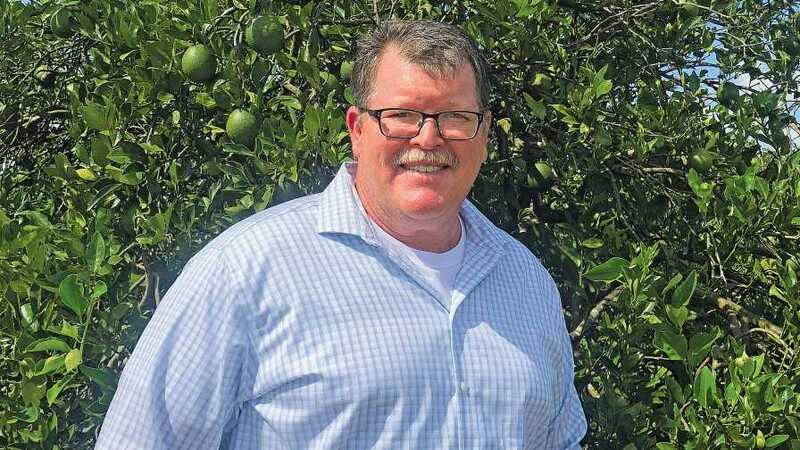 Chuck Allison says a multi-tiered approach to his citrus nutrition program has paid off with productive trees since his groves were planted seven years ago. In the early days, some believed foliar nutrition could supplement nutrition in HLB-infected trees. While foliar nutrition remains very important, most growers agree minor nutrients need to be applied to the soil as well to feed the trees’ roots. A focus on root and foliar health, along with psyllid control, has paid off for Chuck Allison, who has groves near Umatilla. Morgan says a lot more is now known about the impact of soil pH on nutrient uptake in the soil. The reliance on deep-water wells used for irrigation that have high levels of calcium and bicarbonate has increased the pH in these irrigated soils. Treating the soil and irrigation water is now an important facet of nutrition programs. “High soil pH reduces the nutrient uptake, so reducing the soil pH below 7 down to 6 to 6.5 can increase the uptake,” he says. Lee Jones, Gardinier Florida Citrus, says the evolution of his nutrition program reflects how he and other growers have tweaked their programs over the years. 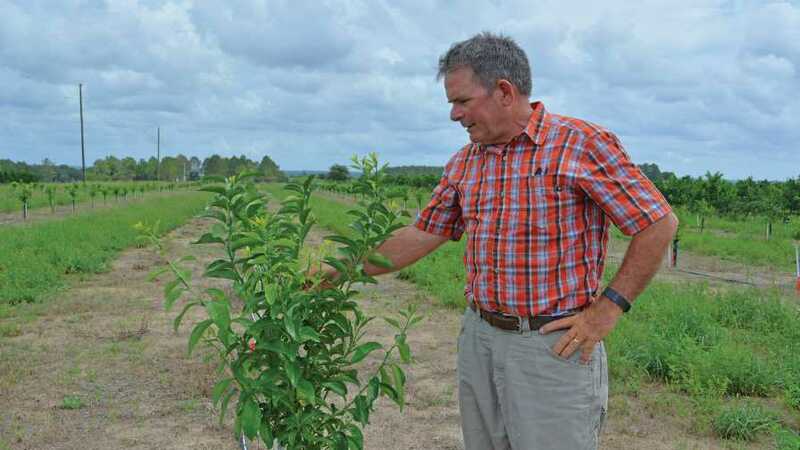 Lee Jones of Gardinier Florida Citrus has added more minor nutrients to his fertilizer program in recent years and is adding compost to encourage beneficial microbe populations. Jones says he has continued to tweak their program, applying more minor nutrients the past couple of years. Growers are still trying to determine what effect bactericides are having on tree health after three years of application. The debate got a little more contentious with a recent interview regarding Citrus Research and Development Foundation (CRDF)-conducted field trials that test product yield impact. The results of those trials show no conclusive evidence the antibiotics are having an impact. AgroSource Inc., the manufacturer of two of the products labeled for use as a bactericide, took issue with the results, questioning if the proper adjuvants were used in the CRDF trials. 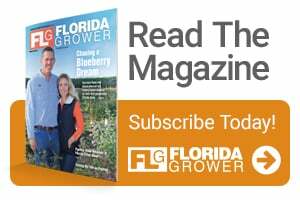 Florida Grower magazine asked CRDF representatives about their response to the questions posed by AgroSource. As of this posting, CRDF noted they were still analyzing trial data and would reply at a later date. Stay tuned for more on this developing story. For years as a Citrus Extension Agent, Mongi Zekri has lended his expertise to growers on various production practices. 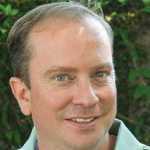 In 2016, he authored the book “The Critical Role of Citrus Tree Nutrition,” which lays out the fundamentals of fertilization. We asked Zekri for a few insights on this important production practice and what growers can learn from his book. Is it important to understand nutritional requirements of citrus trees under Florida conditions? Zekri: Nutrients are required in different amounts. Some fertilizers are more efficient through soil applications. Others are more efficient through foliar sprays. Efficiently producing maximum yields of high-quality fruit is difficult without an understanding of soil characteristics and nutritional requirements of citrus trees. Most Florida citrus trees are grown in soils inherently low in fertility with low cation exchange capacity and low water-holding capacity. These soils are unable to retain sufficient quantities of available plant nutrients. How can growers successfully adjust and refine an efficient fertilizer program? Zekri: Nutrient requirements should vary as the crop load changes. Adjust nutritional programs when severe leaf losses occur due to severe pruning or major weather events such as a freeze, flooding, or hurricane. Reduce fertilizer rates and increase application frequency. 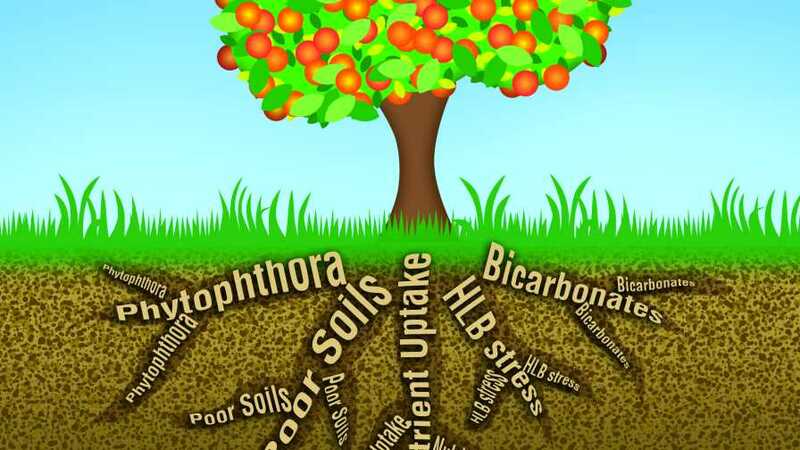 Quantifying nutrients in soils and trees through soil and tissue analyses eliminates guesswork when adjusting a fertilizer program. What are the advantages/benefits of foliar nutrition and fertigation? Zekri: Foliar nutrition is becoming very common and used extensively in citrus production, especially during this HLB era. Environmental considerations also require the use of more efficient methods for nutrient applications. Foliar application of most nutrients is highly efficient because the materials are targeted to areas where they can be directly absorbed into the plant. Fertigation also has been a very efficient way to apply soluble fertilizers to citrus trees. Through fertigation, fertilizer is placed in the wetted area where feeder roots are extensive. With properly managed fertigation, better yield and fruit quality were produced with less fertilizer.